Throughout my whole trip, I tried to find an answer to a question that kept popping up in my head: What exactly is being Singaporean? Searching for the answer, I spent 15 days in this amazing city-state with the Editor-in-Chief of The UOS Times. Before this trip, Singapore, to me, was just another country that had experienced British colonization and an invasion by Japan during World War II, and, lately, has become a growing power in regional commerce. After going on this trip, however, I now feel that Singapore is a small yet vibrant city with its own colors and strengths. 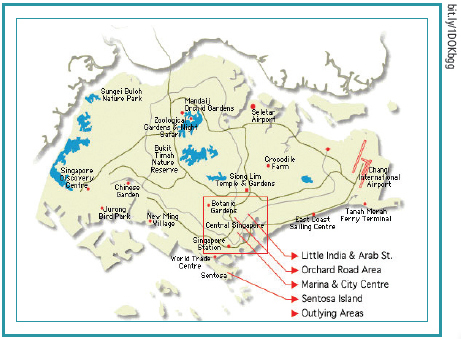 We stayed in the southern center of Singapore, so we could easily travel to other parts of the city. We started off in areas nearby and then went further out: from Bugis, the Old City, Little India, and Orchard Road to Marina Bay Sands, Riverside, the East Coast, and Sentosa Island. 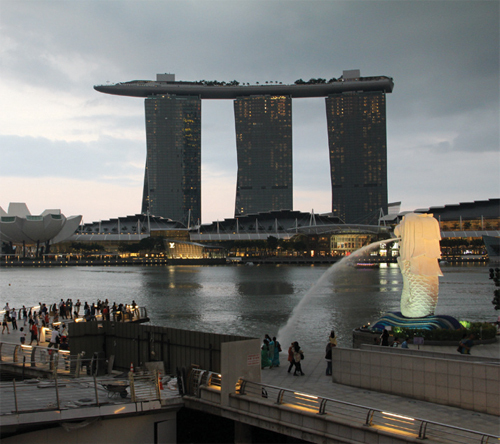 In order to understand the Singaporean lifestyle, we traveled the city from end to end. 15 days in Singapore. Some would say it is too brief to fully understand the country, but I felt that I was there long enough to get a strong sense of the place. Singapore is a very interesting country, one that is very different from others in the Malay World. Singapore was taken over and colonized by one of the great powers of the time, just as its Malay neighbors were. Although most Southeast Asian countries fell victim to colonization and exploitation in the 19th century, and suffered slow economic growth in the 20th century as a result, Singapore did not end up like the “most.” Singaporeans turned British rule into an opportunity. Singapore now sports the seventh largest GDP per capita in the world. Together with Hong Kong, Taiwan, and Korea, Singapore is known as one of the “Asian Tigers,” a group of the most outstanding Asian economies. Where is Singapore located on the world map? It is located on the southernmost tip of the Malay Peninsula, near two major sea routes: The South China Sea and the Indian Ocean. It covers an area of 704 square kilometers, an area only slightly larger than the Seoul City. Little was known about this city before British colonization; Only a few thousand occupied the island before the British arrived. 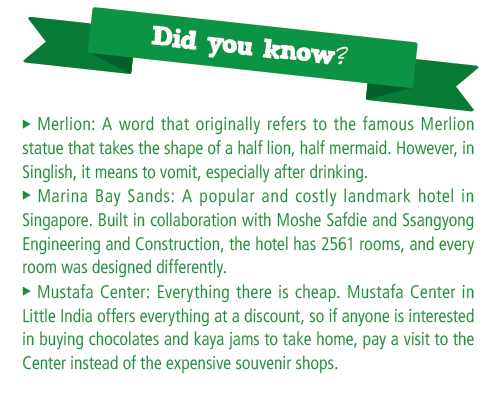 First founded and named Singapura (“City of Lion”) by a Sumatran prince, Singapore started off as a small port. It was primarily ruled by the five kings of ancient Singapura. Then came an Englishman, Sir Thomas Stamford Raffles, who established Singapore as a regional trading spot on Jan. 29, 1819. With his efforts to open up Singapore as a free-trade zone, Singapura soon attracted merchants and immigrants from China, the Malay Peninsula, Indonesia, and the Middle East, who settled into the country as it is now known. 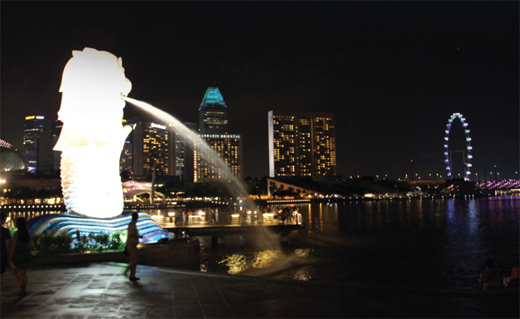 History has played an essential role in shaping the identity of Singapore. Unlike Korea, Singapore was not founded based on a homogenous ethnicity and culture. Instead, it did things the other way round and shaped its identity to fit into the city. 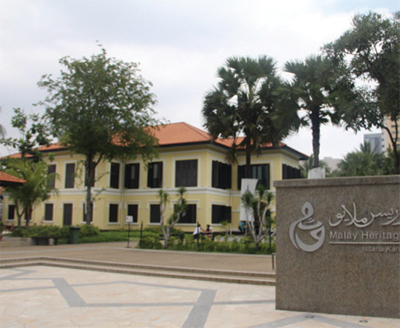 After paying a visit to the Malay Heritage Center located in Bugis, it became clear that Singapore accepted and officially embraced the very differences that exist among many cultures, instead of streamlining them all together. 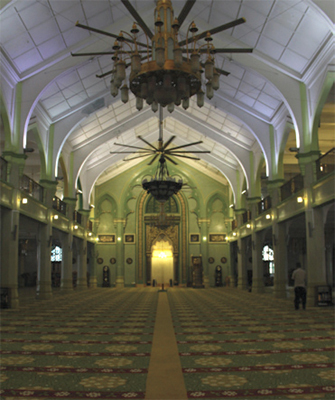 Bugis is a very exotic area where Islamic culture permeates in every corner and holds the oldest Islamic mosque in Singapore. 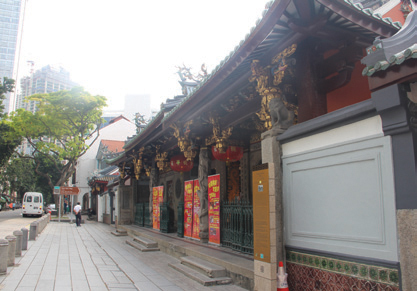 The Center, which stands right in the middle of Bugis was a great place to experience Malay history in Singapore. We also visited the Asian Civilizations Museum, right next to the Raffles statue in the Old City. There, I could get an overall understanding on how the Malay Peninsula was established and influenced by different religions such as Hinduism, Buddhism, and Islam over the course of many centuries. Although the British rule brought drawbacks for the people of Singapore, such as heavy taxes, Singaporeans were ultimately subject to more benefits than losses. Singapore holds not only one of the most active trading ports and the busiest markets in the world, but it also has gained better transportation and a more diverse culture that came with the opening of these places. Singapore’s ethnic diversity is nothing like that of Korea. With Chinese taking up more than 70 percent of the entire population, Singapore is home to many Malays as well as Indians and Europeans. Due to its population diversity, Singapore, unlike many other Asian countries, is not a closeted society. A case in point would be the annual Hindu festivals honoring the Indian god, such as Thaipusam festivals. Although it is a commemoration for Hindus, it is not difficult to find those with different religions enjoying the event as well. Another example is public signs. As soon as we got off at Changi International Airport, we could soon notice signs written in at least three different languages to facilitate the understanding of different races. At the National Museum of Singapore, I could learn more about the Singaporean language which is indicative evidence of cultural diversity and national identity of Singapore. It being a multicultural country, almost everyone there is able to speak more than one language, with some speaking as many as three or four. Most children grow up bilingual and adapt to learn other languages as they become older. Children learn their mother tongues at home to make sure they keep their traditional roots while English is the main language taught in schools. What is the most Singaporean of all is Singlish, which is a unique combination of English, Malay, and Chinese. This informal language is used in daily conversation and understood by most as it consists of many terms derived from other languages. Singaporeans have a huge appetite considering their petite physiques. We could easily spot many people sitting and eating their noodles at 2 a.m. at Kopitiams, local restaurants that are run 24/7. 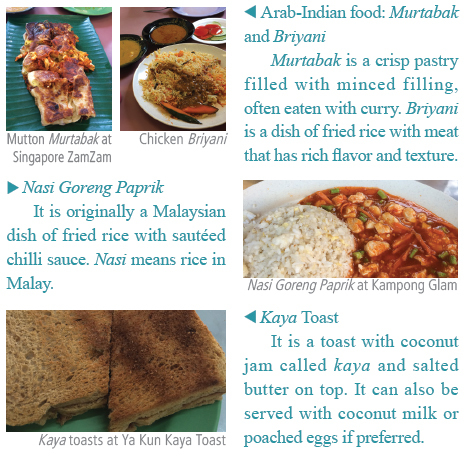 So the cuisine brings me back to my initial question: What is Singaporean about its cuisine? From Chinese noodles and dim sums to fishhead curry from India and Arabic murtabak, nothing seemed Singaporean enough to my eyes. 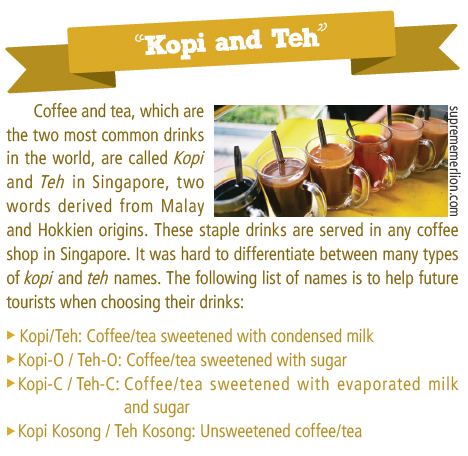 Although almost all of these dishes originate from different countries, they are what make up Singapore now. If you asked me what Singaporean cuisine is, I would answer that it is a number of great dishes that you can eat there. If there is one tip I can give regarding eating in Singapore, it is to be bold and try anything on the menu — except anything with durian! At the City Gallery in Chinatown, I was able to understand how the city developed over the years. Organized by the Urban Redevelopment Authority, the City Gallery showcased a 3D view of the city and the Master Plan. Only a few places in the world are like Singapore: a country, a state and a city all at once. 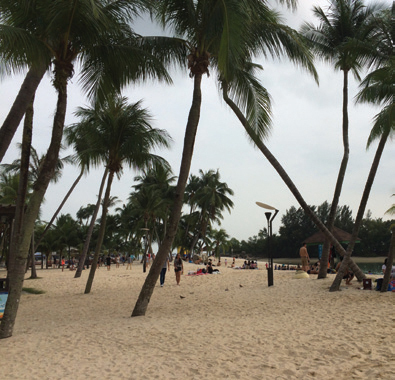 Singaporeans packed all of their needs into the small land they inhabit. Within a limited amount of land, they must cater to the needs of a city; such needs include housing, recreation and businesses. In addition, there needs to be room for power generation, national defense, waste disposal and water catchment. To make their city a livable one, they must be responsive to changing needs, while planning and developing every plot of land. They planned Marina Bay Sands, Merlion Park, and Clarke Quay as their famous tourist destinations for sightseeing, Orchard Road for shopping, Downtown for a financial hub, and Sentosa Island for holidays. In the midst of all this development, what Singaporeans value the most is retaining as much of their natural heritage as they can. 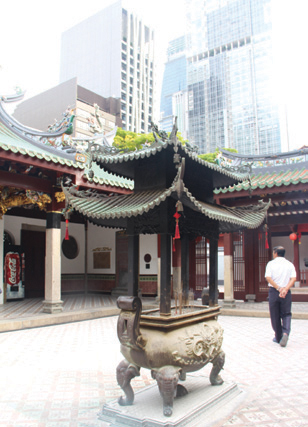 It was amazing for a tourist like myself to be able to see old Chinese temples or mosques coexist with modern buildings. One such example can be found in Chinatown. When we arrived at Chinatown, we could see banks and shopping centers on the main street, often in the form of traditional buildings. Next to these was the nation’s most beautiful Chinese temple, Thian Hock Keng Temple which easily blended into the rest of town. I think this is one of the best parts of Singapore: you will not be surprised to find traditional traces of the past in the middle of a very busy and modern city. During our trip, I felt that civic awareness is a big issue in Singapore. This may be due to the strict law in Singapore. Spitting and littering in public places can easily get you a fine of up to a few hundred Singaporean dollars, not to mention drinking and eating on public transportation. Public transportation is probably one of the best parts of Singapore to tourists — especially Korean tourists with “Sparta” mindsets who wish to experience everything in a short time. Because Singapore is such a small country, only covering an area similar in size to Seoul, public transportation is systemized very well. Other good things about the public transportation were the service and the people using it. Signs were drawn on the ground to guide people to stand in uniform lines at the MRT station, and transfer machines on buses functioned when the bus was fully stopped. I would say people using this service had good manners, and it was hard to find anyone who made their fellow passengers’ experiences unpleasant. What t hese 15 d ays t aught me is t hat Singapore is t ruly a multicultural country with different ethnicities, cuisines and heritages. Having already lived in Australia, I thought multiculturalism in Singapore would not come as a surprise. However, I was wrong, and very wrong indeed. Ethnicity was far more diversified and tangible, which made my experience there very special and enjoyable. If I were to describe the country in one word, the word I would choose, without hesitation, would be “salad bowl.” In this bowl called Singapore, there are various components that give the country a unique flavor and appearance.